In a country where talks of “first” is still high on the social ladder, we have another “first” to talk about for the gay and lesbian community. First, a little back story. It has been seven years since the Episcopal Church created a firestorm of controversy when it decided that indeed a gay man could be a bishop. Fast forward to today and we find that yes a lesbian woman can be a bishop as well. The Rev. 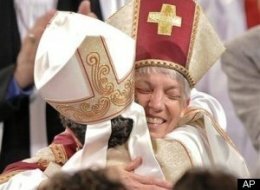 Canon Mary Glasspool, of Baltimore, was ordained and consecrated on Saturday, making her the second openly gay bishop in Episcopal church history and one of the first two female bishops in the Diocese of Los Angeles’ 114-year history. The fact that it has taken 114 years for a woman to become a bishop is amazing – the fact that it is a lesbian women is nothing short of amazing.